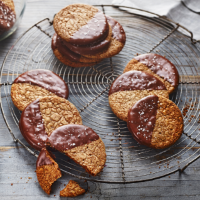 Traditionally, malt extract gives digestives their distinctive flavour. For this recipe I’ve used rye flour – it’s nutty, savoury and gives the biscuits a satisfying snap. 1. Preheat the oven to 180 ̊C, gas mark 4. Line 2-3 large baking trays with baking parchment. Put the flour, baking powder, salt, icing sugar and butter in a large bowl, mixing with a fork (or a food processor) to create a sandy texture. Mix in 75ml cream until it starts to come together; you may need an extra 15ml if it’s dry. Knead brie y to a rough dough; don’t overmix. 2. Liberally pour the worktop and roll the dough out to a thickness of 0.4cm. Using a 7cm cutter, stamp out rounds and place on the prepared trays, about 4cm apart; re-roll any trimmings to create about 24 biscuits. Use a bamboo skewer or fork to make deep indentations in the biscuits. Chill for 20 minutes. 3. Bake from chilled, in batches, for 20 minutes, until golden. Leave on the tray for a few minutes, then transfer to a wire rack and leave to cool completely. 4. Melt the chocolate in a heatproof bowl set over a pan of barely simmering water. Half-dip the biscuits in the chocolate, let the excess drip off, then lay on fresh parchment. Sprinkle with the salt; leave to set for 30-40 minutes. They can be stored in an airtight container for up to 1 week.